Ultimate goal: Enhance interdisciplinary collaboration for improving the entrepreneurship and innovation ecosystem at NC A&T. 1 Keep up with us! : Check out our Instagram page! Keep up with us! : Check out our Instagram page! A space that provides resources, raw materials, tools and technology to spark innovation and creativity (wood, circuit boards, 3D printers, sewing machines, bakery equipment, art supplies, software, etc.) It will be important for this space to be on neutral ground and in a central local (not on the engineering side of campus, nor the business side). This space will also double as a small business incubator for students. Panel Discussions are a great medium for educating students outside of the classroom. 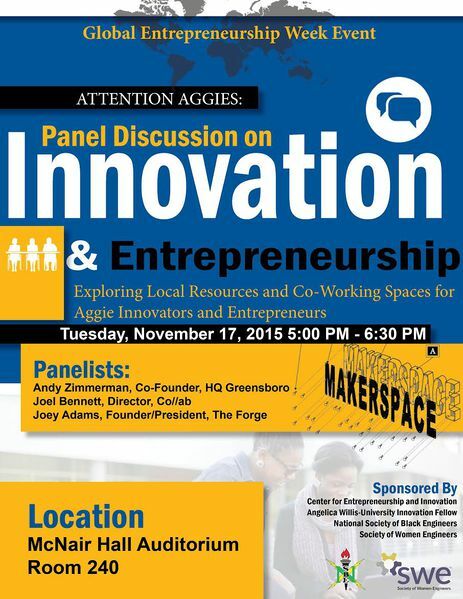 the Innovate A&T Panel Discussion Series will invite innovators, entrepreneurs, makerspace operators, support organizations, faculty, and administrators to speak to students and answer their questions regarding E&I on and off campus. Weall care about the success and advancement of North Carolina A&T, and this annual innovation event will give students an opportunity to identify problems that they see on campus, and provide detailed and comprehensive solutions within a four minute pitch. The solutions will be presented to campus administration, and faculty members with the goal of providing a platform for student ideas on campus issues to the decision makers at A&T. Online and mobile application that is a virtual store where student makers can sell their innovations. This is an effort to fill the funding gap for student entrepreneurs and innovators to generate funds. We can get this off the ground with very little funding required, and I will use my resources within the computer science department and school of business. This mentorship program will match students with an interest in entrepreneurship and innovation to successful A&T alumni entrepreneurs and innovators around the world. This is a way for makers to gain web based publicity for their innovation and entrepreneurship endeavors. These profiles would be hosted on an A&T website page. The Innovation Fair will showcase the various innovation and entrepreneurship opportunities offered on campus. This will increase student and faculty engagement in innovation. Competitions will give the students opportunities to implement what they learned in the pop up classes and work collaboritively with other disciplines. Classes or workshops that provide training in different skills and trades, including classes on entrepreneurship and how to build and brand an idea. Students participation will be voluntary, but the skillsets learned can be carried anywhere. The pop-up classes will be faculty led and will be on a first come first serve basis for students who are interested. Classes incorporated into the student curriculums across campus as either a general education course or through each college on campus. The class will faciliatate co-op experience and have from professors who will facilitate innovative opportunites for the students enrolled each semester. Classes incorporated into the student curriculums across campus as either a general education course or through each college on campus. The class will faciliatate co-op experience and have from professors who will facilitate innovative opportunites for the students enrolled each semester. The University will build and have established relationships with industries and on campus offcies that facilitate the different majors on campus. This will not only benefit the students, but the corporations involved as well as the university as a whole. The Office of Career Services will enhance collaboration between the University and industry partners through the co-op program. This Center for Entrepreneurship will provide student entrepreneurs with metors and resources to start their own businesses. This page was last modified on 25 February 2018, at 07:08.